I am a leader of education who values openness and autonomy. I lead and teach by developing warm relationships with my students, staff, and the community. I welcome diversity and celebrate all kinds of successes and achievements. I am passionate about collaborative practices and raising achievement through innovative learning environments. My classroom is open to community members to share their wisdom and I believe that this is a characteristic of a good school. I am a proven leader of future focused pedagogy and believe that the role of education is to equip our students with the skills to become enviro-ethical decision-makers and culturally competent citizens. If you are reading this online you will be able to view the videos at the end of the CV. If you are reading this on paper - you can see the pictures and let your imagination run wild! CORE’s eFellows are deeply passionate, skilled, and inquiring New Zealand educators from early childhood to senior secondary. They push the boundaries of e-learning by embarking on a year-long fellowship explore innovative, effective, and equitable teaching and learning. I am passionate about our school's potential for education for sustainability and the community links we have to support this unique opportunity. I am continuously reading and reflecting to keep up with up-to-date pedagogy. I am a well-known and connected educator, I have the ability to access information and experts quickly through my extensive professional learning network. I am a passionate leader who has worked in rural and urban communities in schools ranging from Decile 1-10. I have professional knowledge and the skills and disposition to teach all primary school year levels ranging from years 0-8. I see the Principal role to be one of improving outcomes for all of those who belong to the Pukerua Bay Community. I am able to set goals, and pursue them to ensure success for all of our community. I am loyal and believe that I will make a great contribution as leader of Pukerua Bay School. I will strive to equip the children of our community with enviro-ethical decision making tools. I will carry out my leadership with purpose, professionalism and positivity. I relate well to others. I make time for people. I believe in trust, openness, empowerment, and autonomy. I believe in connected, collaborative, and innovative environments. I have the skills to grow a learning community that is future focused and sustainable. I am self-aware and seek feedback on my performance. I am a role model in terms of continuous learning and improvement. I will continue to learn about growing teachers and learners. I will work hard to create a culture where all staff work collaboratively towards a shared vision. My goal is that all of our community can articulate our vision to anyone who might ask. ICT Whizz-kids after school eLearning club (Coordinating planning, activities, resources, teachers, and students). School Website Development (Coordinating a school-wide balance of class and teacher contributions to website, working with Principal's vision and liaising with webhosting providers). Milking Cows, Feeding calves, general farm maintenance. Development, implementation and delivery of hands-on education programmes at Otago Museum. Leader of the 'For Teachers' section of the Museum's website. Leader of the Primary School's Annual Science Fairs. Leader of Teacher Workshops for special exhibitions. Delivering tutorials to tertiary students. Evaluating essays. Conducting research for Management and Gender Studies Departments.
" @taratj turned a crisis into an opportunity for so many with #latsunconf . #Leadership with capital L. Thank you..."
"Tara and Jo are delivering such an inspiring talk on new authentic, real ways of learning in schools. #tdc13"
Tara Taylor-Jorgensen. 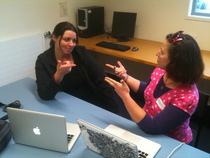 is the eLearning lead teacher at a brand new school (Amesbury) in Wellington. Prior to this she was a classroom teacher in Otara, South Auckland. Tara has been recognised as a Google Certified Teacher and a Core Education eFellow. Her passions are in Self Oganised Learning, Minimally Invasive Education and learning through the creation and consumption of video. The use of cyber agreements - are they relevant? Hover your mouse over these to view the blurbs.